Review by Nathan Hinkle, Sept. 26, 2014, 6 a.m. The Light & Motion Urban series has been one of my favorites for a while, so I was excited to see the Urban 2.0 update this summer. The new Urban series carries the same design and features as the older series, but with redesigned internals. The lights are now fully waterproof, and all lights in the series have the peened reflector that debuted with the Urban 700. The Urban 350 in particular is exciting because it's the first L&M headlight that I feel is in the price and output range that appeals to the most riders. The Urban 200 wasn't bright enough, and the Urban 400 was a bit too pricey. At $70, the 350 hits a good balance between power and price. The optics of the Urban lights are unparelled in this price and output range. Many lights in the 300ish lumen category have a relatively narrow beam that adequately lights up the road directly in front of you, but with no spill to see anything to the sides, but the 350 has a custom engineered reflector that creates a wide, smooth beam. 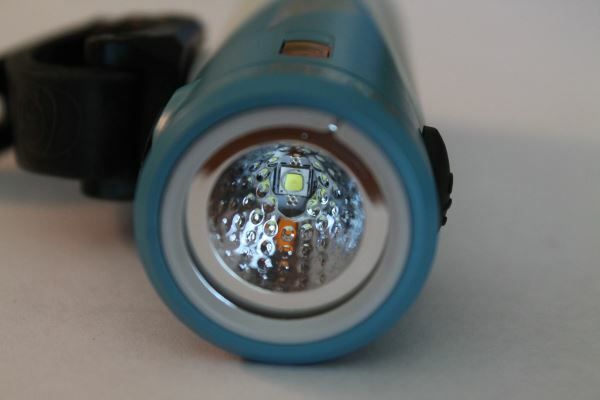 Compared to the Serfas USL-305 with similar specs, the Urban 350 feels like it puts out way more than 50 additional lumens, because the light is put to better use. The Urban series' iconic amber side visibility lights are also present on the Urban 350. While many headlights have cutouts near the lens to increase their off-axis visibility, the Urban has separate, dedicated amber lights for visibility. Because they go directly through the side of the light, they're visible for nearly 180°, making the Urban the best headlight I've seen for safety visibility. All Urban 2.0 lights have done away with a strobing flash, in favor of the new "pulse" mode. In pulse mode, the light modulates about once per second between the low level (75 lumens) and a slightly lower level, probably about 25 lumens. The pulse mode is much subtler than the flashing mode found on many lights. This has its pros and cons. It's not nearly as distracting and disorienting as the high-frequency strobing found on many lights. However, especially in broad daylight, it's sometimes difficult to tell that the light is flashing at all. I would like to see two different pulsing modes, a subtle one like that included, and a more attention-grabbing, faster pulse between full brightness (350 lumens) and near-zero output. The light is of course more than bright enough for daytime visibility on its highest setting, and I appreciate L&M's attempt to respond to increasing criticism of distracting flashing bike lights. A more useful daytime flash pattern would be welcome though. As with most lights these days, the Urban 350's internal lithium battery is rechargeable by Micro USB. Unfortunately, you're stuck charging at 0.5 A, even if you have a higher-rated charger. L&M offers a "fast-charge" version of the Urban 800, but it's significantly more expensive. With many new lights offering fast charging, it seems like a significant omission, but the convenience of USB charging is still appreciated. Light and Motion has led the way in conducting standards-compliant testing on their lights and publishing the results. The ANSI FL1 Standard defines specific ways to measure and report light output and battery life. I tested the Urban 350's battery life using a calibrated light meter per the FL1 Standard's methods, and got the same 1:30 hours of runtime that L&M reports. The light output is almost perfectly constant the entire time, rather than dimming as the batteries run down like some lights do. The runtime is fairly standard for single-piece lights, but if you need a longer runtime and don't need a higher output, you can get one of the brighter Urban lights like the 500, 650 or 800. On the low setting, they'll put out about as much light as the Urban 350, but the battery life will be much longer. The Urban series also features the best battery life indicator I've seen on any headlight to date. A small LED on the back of the case changes color from green to orange to red to flashing red as the battery life drains. This ensures plenty of warning when the battery starts to drop, so you won't get stuck with an unexpected low battery. My only gripe is that the LED is on the backside of the light, not the top, which makes it a bit difficult to see when riding. 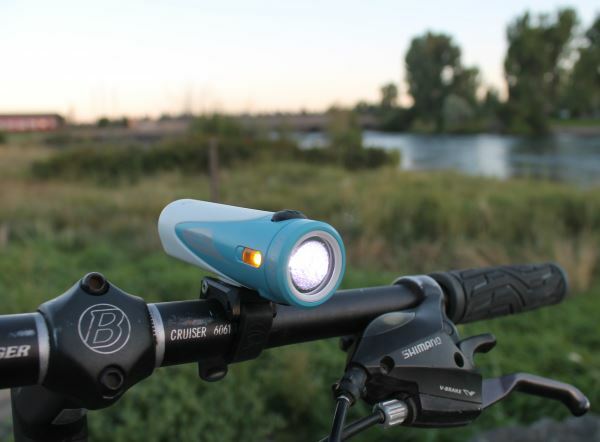 The Urban 350 uses a simple rubber strap mount that is attached directly to the light. The strap wraps around the handlebars, and a plastic peg on the mount goes through the holes in the strap. This mounting system is simple and it works well. You don't need to keep track of multiple pieces, the mount stays with the light when you move it between bikes, and it doesn't require any tools. I've been told by friends with smaller hands that it can be difficult to get on if you can't pull hard enough to get the holes over the plastic knob, although the band does get easier to use over time as the rubber loosens up. The light has a single button, which cycles the light through High, Medium, Low, and Pulse modes. Pressing and holding the button for 6 seconds locks out the light to prevent accidental activation in backpacks or panniers. The light flashes red 3 times when going into lockout mode. To unlock, press and hold the button for 6 seconds until the indicator flashes green 3 times. Having had lights turn on in my backpack, get really hot, and run down the battery before, this is a welcome feature. The button is easy to use, even with gloves on. 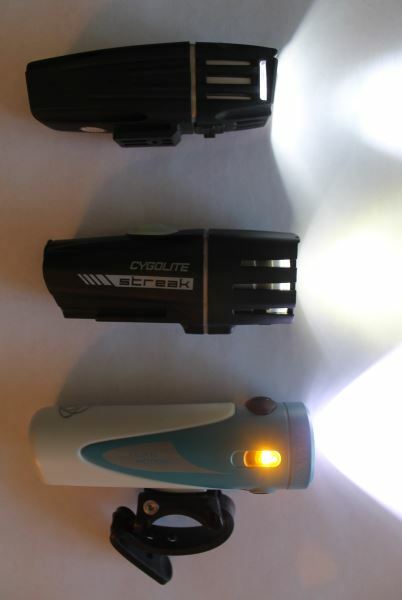 The Cygolite Metro and Streak are great lights, offering more versatile flash options than the Urban and coming at a great price to performance ratio; however their mounts are frustrating to use and not quick to swap between bikes. The optics are adequate, but not nearly as wide and smooth as the Urban's. While they do have side visibility cutouts, they're not nearly as bright or visible from as many angles as the separate side visibility ports on the Urban, and they lack some of the non-necessary but convenient features like a color-coded battery level indicator and a button lockout. The Serfas USL-305 has a fantastic mount that rivals the Urban series and is much better than the Cygolite mount. 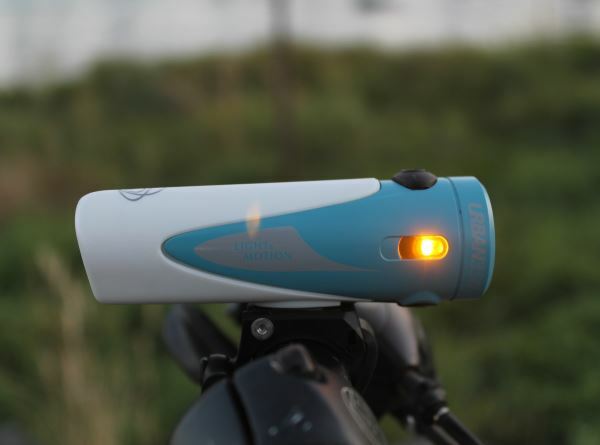 It has one flashing mode, which is better for daylight visibility than the Urban's pulse mode, but doesn't have any less-distracting flashing mode for night riding. It has a very similar beam spread to the Cygolite products, which is much narrower than the Urban's beam. Its side visibility ports are more pronounced than the Cygolite lights, but again not nearly as bright as the Urban's. It also lacks a battery level meter or button lockout mode. I haven't tried the Lumina 250 in person yet, but it's one of the more expensive choices for one of the lower outputs. NiteRider's Lumina series does feature a button lockout mode, but lacks side visibility ports. Overall I think the Urban 350 is worth its premium price. 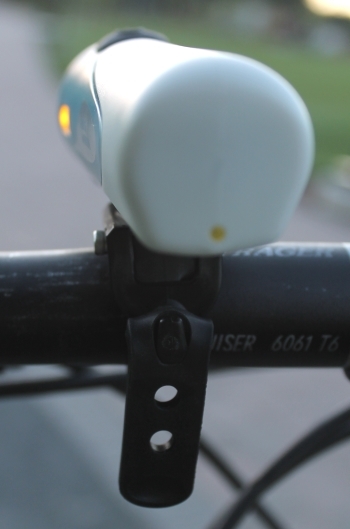 It has the smoothest, widest beam of any light in its class while still projecting plenty of light far forward; its bright amber side lights make it second-to-none in terms of safety visibility; the mount is simple, easy to use, and secure; and it includes numerous small, thoughtful features like the battery level meter and button lockout mode that add up to form a premium light at an overall affordable price. While it doesn't affect functionality, the light is also available in multiple colorful styles, which adds a nice sense of flair to your bike. 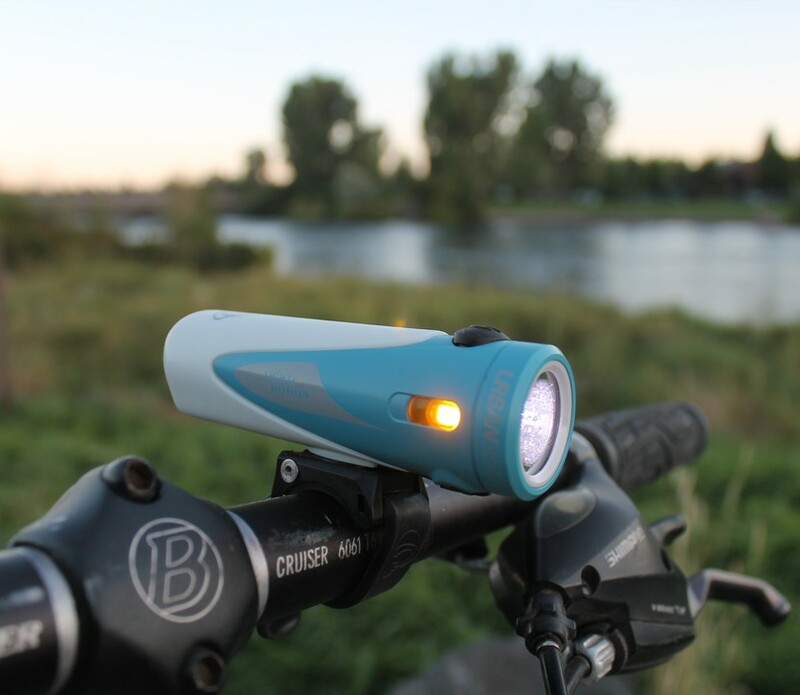 Add in the IP67 waterproof rating (waterproof to 1m for 30 minutes) and the fact that the light is assembled by hand in the USA, this light is a great choice for commuting, road cycling, or just biking around town.